Enjoy Bigelow French Vanilla Tea. A Distinctive Taste In Tea With A Rich And Robust Vanilla Flavor. Naturally & Artificially Flavored. Individual Fresh Pack. Experience More Than Just A Tea. Take Time For Yourself And Enjoy More Of What Life Has To Offer. The French Know How To Enjoy The Good Life By Making Each Moment An Experience. They Have Learned The Pleasure Of Taking Time For Themselves. We Invite You To Take A Private Moment, To Relax And Unwind With A Delightful Cup Of Bigelow French Vanilla Tea. Its Rich Vanilla Flavor Will Calm Down Even The Most Hectic Days And Because It Has No Calories And The Added Benefit Of Healthy Antioxidants, It's Good For You Too! Remember More Good Things Are What Every Lifestyle Needs. Vive Le Bigelow French Vanilla Tea! 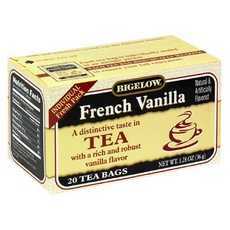 Bigelow French Vanilla Tea - A Sure Way To Please Your Senses And Enchant Your Taste Buds. Milk And Sweetener Round Out The Delicious Flavors. Each Tea Bag Is Individually Sealed In An Airtight Packet. Each Tea Bag Is Individually Wrapped To Ensure Your Full Enjoyment. Blended And Packaged In The Usa. (Note: Description is informational only. Please refer to ingredients label on product prior to use and address any health questions to your Health Professional prior to use.